The loss of a child or grandchild is one of the most painful experiences we could ever go through. Many know the hurt and emptiness one lives with daily. The loss may have been before the child was born through a miscarriage or abortion. It may have been a premature birth or stillbirth. Many have lost a child through an illness, accident, or act of violence. However the loss occurred, the sadness and grief is real and is often difficult to share. This is a place where you may grieve and reflect on your feelings. It is our prayer that this will be a place of healing, restoration, and most importantly -a garden of HOPE. 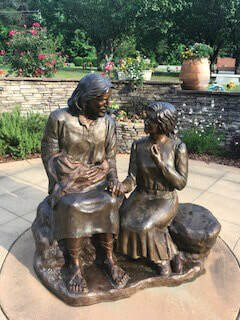 The Hope Monument is a life size bronze sculpture of a young woman sitting next to Jesus. Jesus has a baby secure in His arm and is lovingly looking at the woman and holding her hand. He might be saying to her, “Put your hope in Me, for in Me you will find unfailing love and full redemption.” There is actually a place for someone to sit on the bronze sculpture next to the young woman. Our desire is for men and women to sense forgiveness, not condemnation, and to receive comfort, hope and healing. Those who stand in front of the “Hope” sculpture are reminded that Jesus is lovingly caring for their child. Our Hope Monument is dedicated to reaching hurting hearts in our communities. A memorial service is held on the second Saturday in September at the Garden of Hope.